Our flagship 4 bedroom, 3 bath home just 5 minutes from the Magic Kingdom with hi-speed internet access. Make our home your place of refuge after a long day at the parks, golf courses or outlet stores. our home to be just the kind of clean, spacious accommodations that will allow you to relax and recharge your batteries for the next day of adventure. One master suite has a King bed, private bath and access to the pool area. The second master has a Queen bed and its own private bath. Each master has its own television with Direct TV programming. The other two bedrooms each have two twin beds and share a full bath. One twin bedroom has a Nintendo 64 game system and numerous games for the youngsters....allows them to play without tying up the family room TV. The family room is furnished with attractive, upscale furniture that has held up well to a year of use. The couch opens up into a Queen sofa bed for you to factor into the sleeping arrangements or for watching late night movies. The family room television is equipped with Direct TV satellite programming and a combo DVD/VCR player. The screened-in patio/pool area (our favorite place) gets tons of sun. 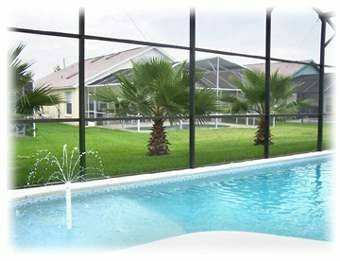 There is a large lanai for relaxing, reading, conversing or eating prior to taking a dip in the pool. The lanai has a ceiling fan with table and comfortable lounge chairs. One end of the pool has a kiddie wading area with a fountain for their enjoyment. There is a barbecue gas grill in the lanai for your use at no additional cost. The kitchen, which connects with the lanai, has everything you need to prepare dinner or reheat the leftovers from the previous evening's dining. There is a washer/dryer at the home. All towels and bed linens are provided. A pack-n-play portable crib is available at the home for no additional charge.